Shortly before he died in 1830, Simón Bolívar asked his doctor, "How will I ever get out of this labyrinth?" Bolívar was South America's most celebrated independence hero  remembered today as El Libertador, the continent's liberator  but the Venezuelan general and Latin American sage passed away unhappily in Colombia, ousted from power while once adoring crowds jeered him as a tyrant. As a result, although he was said to have died from tuberculosis, conspiracy theories have long surrounded his demise. Few have promoted that speculation more passionately than Venezuelan President Hugo Chávez, who in his marathon speeches extols the demigod Libertador the way priests summon Christ at Mass. Chávez, who calls his left-wing, anti-U.S. movement the Bolivarian Revolution, has never accepted the idea that Bolívar may have perished from natural causes and not as a result of intrigue. So when a U.S. doctor last spring presented research at a University of Maryland conference on the deaths of famous people  findings that suggested Bolívar died from arsenic poisoning  Chávez started to arrange for El Libertador's exhumation to test that hypothesis. 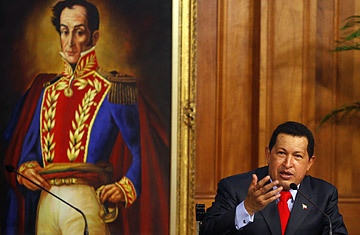 "In my heart, for years, I've had the conviction that Bolívar didn't die of tuberculosis," Chávez declared. "I think they assassinated him." On Friday, July 16, before dawn, a Chávez government team ceremoniously opened Bolívar's casket in the National Pantheon in Caracas, where his remains had been brought from Colombia in 1876. On his Twitter account (RT@chavezcandanga), Chávez breathlessly tweeted, "My God, my God, I confess we have cried, we have sworn. This glorious skeleton must be Bolívar because you can feel his ardor." Venezuelan forensic experts will now conduct DNA, X-ray and other tests in the hopes of determining if the arsenic-poisoning theory is correct. Doctors in the 19th century had assumed Bolívar was felled by tuberculosis because of foul, greenish fluids found around his lungs and heart. But Auwaerter says that symptom is consistent with not tuberculosis but bronchiectasis, a serious bacterial infection often associated with arsenic poisoning. Bolívar as a result may also have been the victim of a severe fungal infection, Auwaerter adds. Another Bolívar expert, Dr. John Dove of Scotland, said at the Maryland conference that while he still believes tuberculosis was the main cause of death, arsenic may have hastened it. Dove noted that South America was plagued by power struggles after the Spanish were driven out in the 1820s and that "there were plenty of people who would have liked to have finished [Bolívar] off," including many of his own generals, especially after he tried to set himself up as dictator of the short-lived republic called Gran Colombia (which included Venezuela). One assassination attempt in 1828 in Bogotá nearly succeeded but was thwarted by Bolívar's lover. Still, every historical account of El Libertador's death, brought together in Gabriel García Márquez's masterly 1989 biographical novel The General in His Labyrinth, has it occurring peacefully at a ranch house near the northern Colombian city of Santa Marta. Auwaerter fears that he and Chávez "are working at cross-purposes," and he admits, "I do have some concerns" that the Venezuelan leader is misinterpreting his research. Doctors aren't the only ones concerned: the Bolívar assassination theory has contemporary political ramifications. Chávez, who took office in 1999, has for years insisted that he himself is a target for assassination, not only by shadowy forces in the U.S. but also from neighboring Colombia, whose outgoing President, the more conservative and U.S.-friendly Alvaro Uribe, Chávez has frequently accused of wanting to attack Venezuela. With Venezuela's oil economy slumping and Chávez's Socialist Party facing unusually competitive parliamentary elections in September, his critics suggest that reviving the idea of Bolívar's martyrdom could be a move by Chávez to galvanize his political base. On Friday, after Bolívar's exhumation, Chávez angrily responded to Bogotá's recent accusations that Marxist Colombian guerrillas still pass freely across the countries' border. "Uribe, aided by the Yanqui empire, is full of hate [because] his efforts to isolate Venezuela have failed," Chávez said. Chávez supporters, however, insist the President is right to seek an explanation for the death of Venezuela's and South America's most hallowed hero. And given how long and meticulously Americans have pored over the deaths of U.S. political icons like Abraham Lincoln, those Chavistas have a point. But just as Americans have had to come to terms with some uncomfortable truths about Lincoln  like the fact that he was a reluctant emancipator of the slaves  Chavistas would do well to take Bolívar's exhumation as an opportunity to ponder El Libertador's own complexities, especially the fact that he ended up betraying the democratic ideals he promoted. That's a labyrinth no amount of DNA testing can find the way out of.